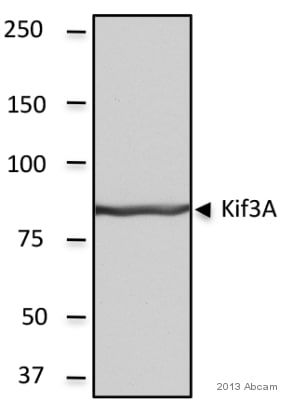 Synthetic peptide conjugated to KLH, corresponding to amino acids 682-701 of Mouse KIF3A. This sequence is identical in human. WB: HeLa and MDBK cell lysate. ICC/IF: Primary hippocampal neurons. IHC-P: Rat brain tiisue; mouse brain tissue. 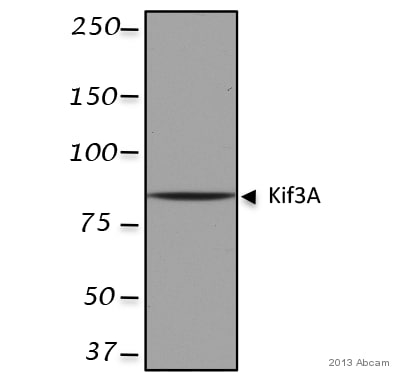 Whole antiserum is fractionated and then further purified by ion-exchange chromatography to provide the IgG fraction of antiserum that is essentially free of other rabbit serum proteins. Our Abpromise guarantee covers the use of ab11259 in the following tested applications. WB 1/2000. Predicted molecular weight: 85 kDa. 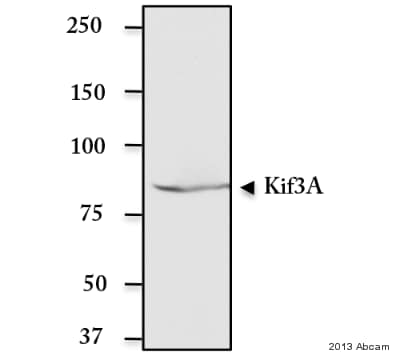 This concentration is determined by blotting using a rat brain homogenate and a whole cell extract of rat pheochromocytoma PC12 cell line. 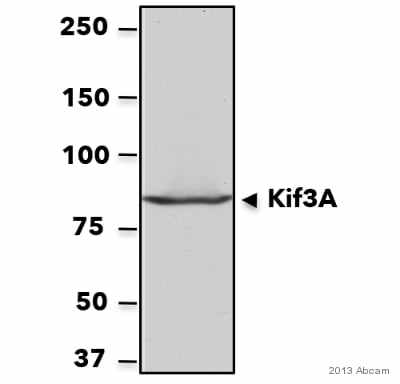 Staining of KIF3A is specifically inhibited by the KIF3A immunizing peptide. Microtubule-based anterograde translocator for membranous organelles. Plus end-directed microtubule sliding activity in vitro. 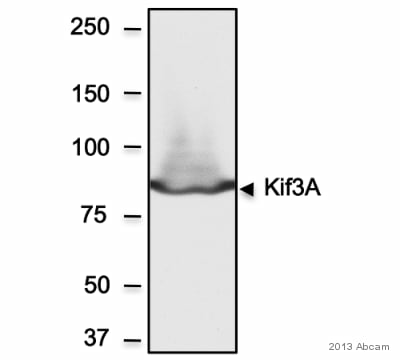 ab11259 (1/2000) detecting KIF3A in Human Hela Cells. 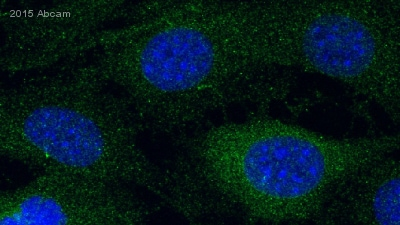 As a control, cells were transfected with scramble siRNA (left) and KIF3A siRNA (right). Please refer to abreview for further experimental details. Paraffin-embedded rat brain tissue stained for KIF3A with ab11259 at 0.1 μg/mL in immunohistochemical analysis. 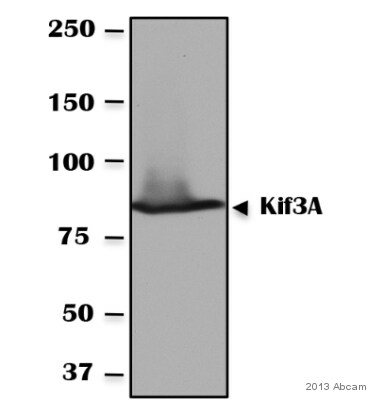 Paraffin-embedded mouse brain tissue stained for KIF3A with ab11259 at 0.4 μg/mL in immunohistochemical analysis. 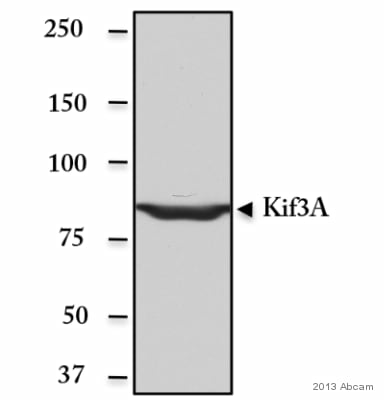 Immunocytochemistry/ Immunofluorescence - Anti-KIF3A antibody (ab11259)Image courtesy of an anonymous Abreview. 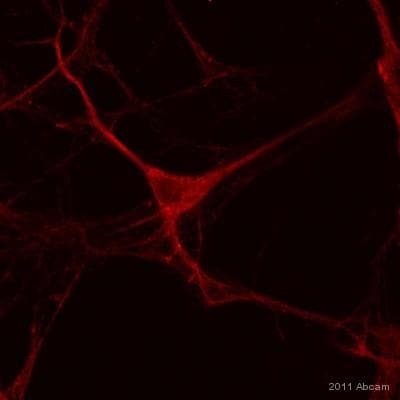 ab11259 staining KIF3A in murine primary hippocampal neurons by Immunocytochemistry/ Immunofluorescence. Cells were fixed with methanol, blocked with 1% BSA for 1 hour at 22°C and then incubated with ab11259 at a 1/50 dilution for 2 hours at 22°C. The secondary used was a Cy3-conjugated donkey anti-rabbit polyclonal, used at a 1/500 dilution. Publishing research using ab11259? Please let us know so that we can cite the reference in this datasheet.